Over the last 25 years, obesity rates among children and youth in Canada have nearly tripled. 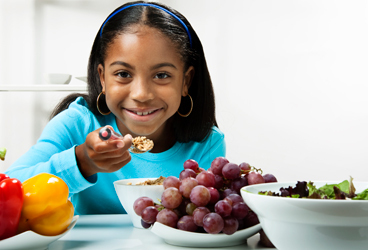 Be sure your child is eating well, as good nutrition fuels your child's growth and development. Canada's Food Guides - Follow this link to information about eating well with Canada's Food Guides. Childhood Obesity - Learn about the risk factors involved with childhood obesity and how to help your child maintain a healthy weight. 10 big myths about food - Eating your way to good health. Making the grade - How to eat your way to a successful school year. Dial-a-Dietitian - Dial-a-Dietitian connects callers to a Registered Dietitian, a licensed health professional who has studied the science of nutrition. Service is free of charge. Dietitians of Canada: Nutrition A to Z - Healthy eating is a key factor in promoting good health. These nutrition resources covering topics from Active Living to Zinc will help you make the right choices for your individual health needs. Favourite Family Foods Online Cookbook - In this cookbook from the Manitoba Healthy Baby Program, you will find delicious, nutritious, easy to prepare, family friendly recipes and cooking tips. Food Safety - Learn about Health Canada's four easy steps to help keep food safe and more. Brown bag special - Information about packing nutritious school lunches. Healthy Eating for You & Your Family - Health Canada tips on healthy eating, meal ideas and planning, shopping and more. Healthy Eating Information - Find out how to promote healthy eating in your family and at your child's school. Manitoba School Nutrition Handbook - This handbook is designed to help school communities develop nutrition policies and implement changes to promote healthier eating options. Nutrition Resources & Menus - The Winnipeg Regional Health Authority offers a number of nutrition resources to groups and organizations.